What's the best social media tool in your digital pocket? The one that's accessible. That was an obvious one. More than that though, I think it's also the one that you actually use. It makes no sense to invest your time or money into something that becomes shelfware. I would argue that the best social media tools are in your smartphone. It's with you 100% of the time, so it meets the accessibility requirement for sure. It's not that you are using the iPhone features – you're not using the right apps! I gave this as a presentation to a local business group in October of last year, and many of them have told me they are using these apps today. Want to download the presentation? Click here to get the download. Content is at the heart of Social Media, so it makes sense to start here. Follow the rule of social media thirds. One third of your content should be self-serving and promotional, one third needs to be industry related, and the other third can be fun engaging posts. This offers a natural mix of posting. Think of your contractor posts as if was a personal profile. None of your friends wants to see you begging for business every post. We're starting this list off with a mega free app called Story Chief. 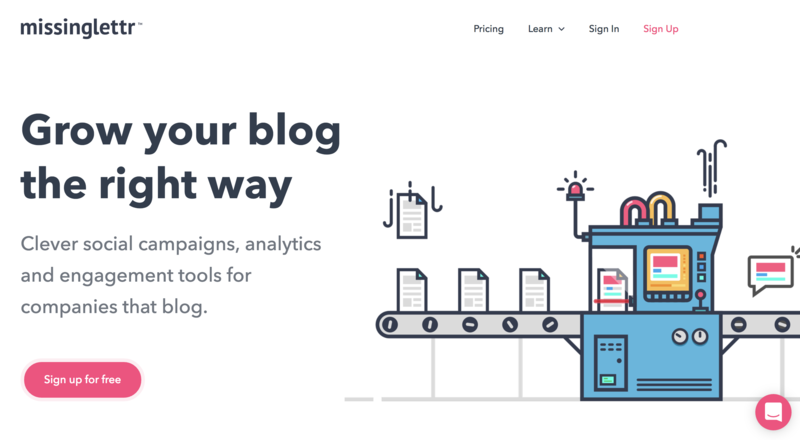 At it's core, story chief is designed to help you write better articles. In fact, I'm writing this article inside story chief now. That's where the differences between Story Chief and most other writing tools end. Social channels – here you'll specify which social channels to publish to, the content to include in the post, AND schedule it to go post at a later time. Feedly helps solve the I don't know what to post dilemma. After setting up your account, you'll select topics that you want to create a feed for. 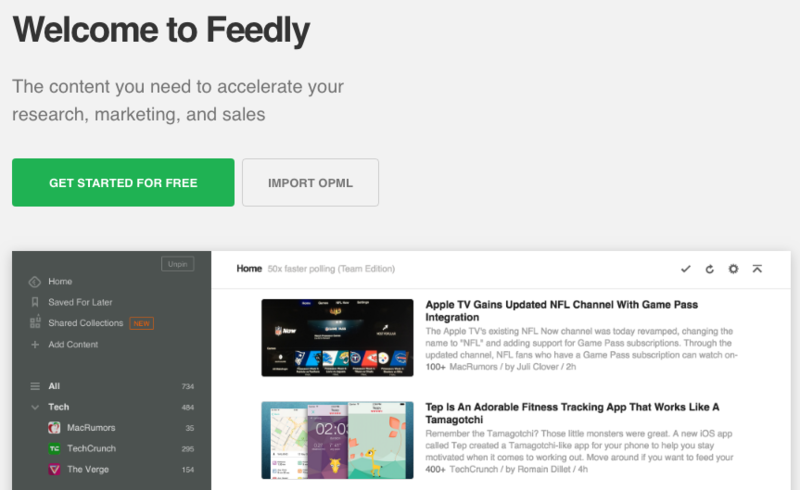 Then, feedly scours the web for you looking for articles on those topics. It also integrates with several publishing tools, which we cover in the third section. How many times have you started to read an article, only to get interrupted and needed to pause. Or, maybe you're doing what I do, you open a link into a new tab so that you can go back to it later. Or maybe you read the whole article, and wanted to share it, but not quite yet. That's the old way. The new way is Pocket. Say you're scrolling through Twitter and you find a great article. All you need to do is tap the link, then click the share button on your phone and "Save to Pocket". It's literally a digital pocketful of content that's saved for later! Then, when you're ready to read it or share it, just go to the pocket app and your links are all saved. Pocket also integrates with publishing apps, so you can select pocket as your source to schedules posts. 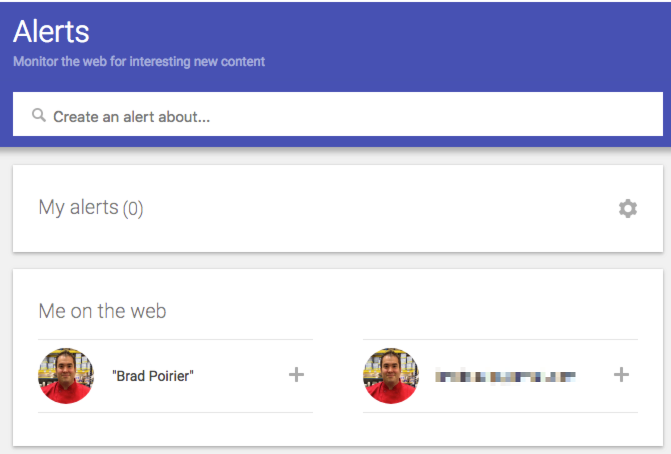 Using Google alerts couldn't be more simple. You just go to http://google.com/alerts, setup a search term you want to be alerted of new content for and boom. Basically, you're saving a "google search" for getting alerts. Say you wanted to get an alert anytime Cambria Countertops was mentioned in the news. In Google Alerts, you'll literally type in: Cambria Countertops, and the next time they are mentioned in the news, you'll get an alert. Once you have the content, now make the content work for you. Canva is an excellent design tool that allows you quickly and easily make social media graphics that will really pop out. You don't need any design skills, and hardly any computer skills. By using their pre-made templates, you can pump out graphic after graphic. Canva is easy to use and you can get an image out in minutes. Hands down, Adobe Spark has the best mobile app for creating social media images. You can either start with a template or start from scratch. You just choose a photo, add some text, and then make it spark. The Spark app excels in bold typography. You can fit your message inside many different shapes and sizes, and it will automatically adjust the font size based on the shape size. You can also add color overlays to the image to make the text easier to read. A brand new feature to the app is animated text. You can select the text, and have it animate – so it essentially turns your plain old image into an video! 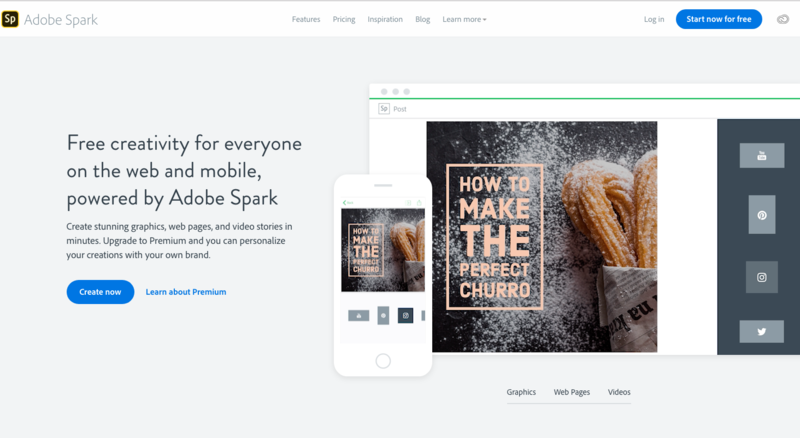 Spark has easy sharing built right in. Once you're done with your image, you can either save it to your camera roll, or share it directly to any social media network. You can also send it to your buffer or hootsuite app to schedule it for later. Meet your new best friend. Stencil is similar to Canva, but a lot more flexible. With Stencil, any layout available to you is included, you're not paying per layout. Stencil gives you the most amount of design options than any other design app I've seen. A handy feature is that you can upload your logo, and keep it in an "assets" area. You can upload a few variants of your logo also, such as a standard version, then upload an all white version, and then grayscale version. You can just turn it on or off depending on which logo is useful for that design. If you elect for their paid plan, you'll get over 2.8 million photos, icons and graphics to choose from to help you out. By the way, their most expensive plan is $12/mo when paid annually. So, it's also the most affordable of the paid versions. Stencil also has a direct publishing feature. So once your layout is done, just share to your selected social networks. As a bonus, you can preview what your social media post will look like, so you can make it perfect! You know how you've been saying: "I wish I could create videos for social media, but I don't know anything about computers." Boom. Rocketium allows you to "make buzzfeed-style videos in under 5 minutes." It's true, I've made them and under that time frame. Facebook Cover – You can create a video for your Facebook cover this way! Pssst: If you really like using Rocketium and want to upgrade to a paid plan, use code AFBRAD10 and save 10% off your monthly plan! You have the content, it's beautiful – now it's time to publish. First up on the list is our newest social media platform that we're in love with. In fact, Later is the primary social media platform we use at Bear City Impact. We have a full write up on why we switched to using Later. Content Studio is actually a three fold tool. 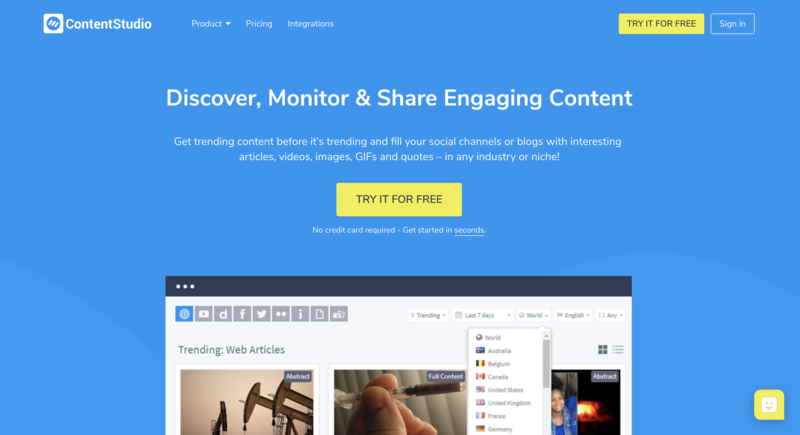 It allows you to discover (content curation), publish, and automate your social media pages. Regarding the publishing side of the app, Content Studio is second to none. In their discovery tab, you can see the latest trending articles from around the web, so that you can share buzzworthy content. Or you can search by keyword, topic, hashtag, etc. 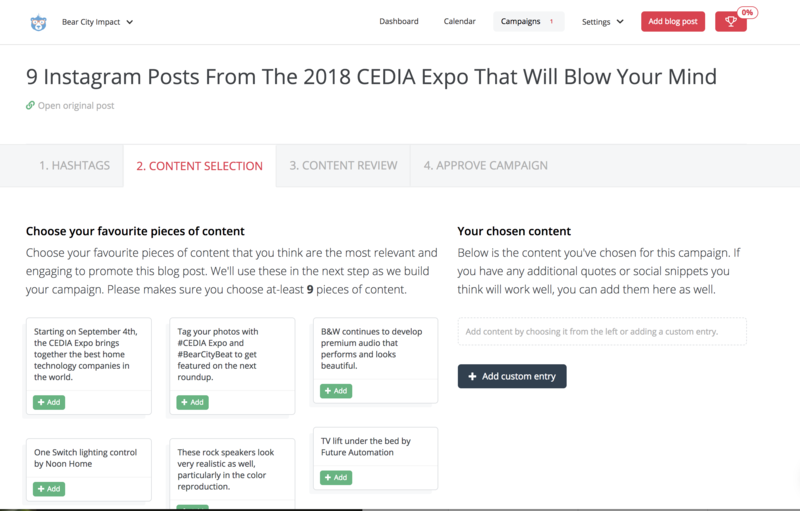 Where Content Studio differs from the other content curation apps mentioned above, is that you can schedule that content right from within the dashboard. Once you find a piece of content that you want to share, you'll see how many times it's already been shared on the web. You can then click the share button, and either publish the content immediately, or schedule it to go out on a queue. When you create your account, Content Studio will setup a publishing queue based on the networks you want to publish to, and the days and times that are most useful for publishing. You can, of course, modify the queue schedule. So now all you have to do is add content to your queue and you'll never run out of posts to your social media accounts. Ya'll got a blog? Cool. Well, social promotion should be a big part of your blog traffic. You want to get other people to share your content. You need to get your content out there first though. Hmm. MissingLettr is so stinking easy to use. Add your blog's rss feed to your account. Then, whenever you publish a new post, you'll get a happy little email from MissingLettr saying they have a new social media campaign waiting for you! MissingLettr pulls content from your blog post into wonderful snippets. You'll need to select at least 9 of these to get started. Just click the +ADD button! The reason you need to select at least nine snippets is because MissingLettr is creating a year long social media campaign for you. They will schedule your social media posts one at a time at different intervals spread across the year to go out. So for instance, if you are blogging on a weekly schedule and using MissingLettr, you'll have a constant flow of original content being shared on your social media to your blog. Even if you only blog once per month, that means one blog = nine pieces of content for the year. So in this case, for day 0 (which is the first post to go out basically), you'll select how your social post will look. You first choose wether you want the post to include a native image from the blog, a bubble image, or just plain old text. If you choose the bubble option, it turns your text into fun bubble quotes that appear as images on your social posts. I think this is a creative way to share your content, especially when the blog post might not be media rich. If you don't like the quote shown, just hit the arrows until it brings up one you like. Hootsuite is one of the top contenders when it comes to publishing apps. Most social media publishing tools offer a free plan. 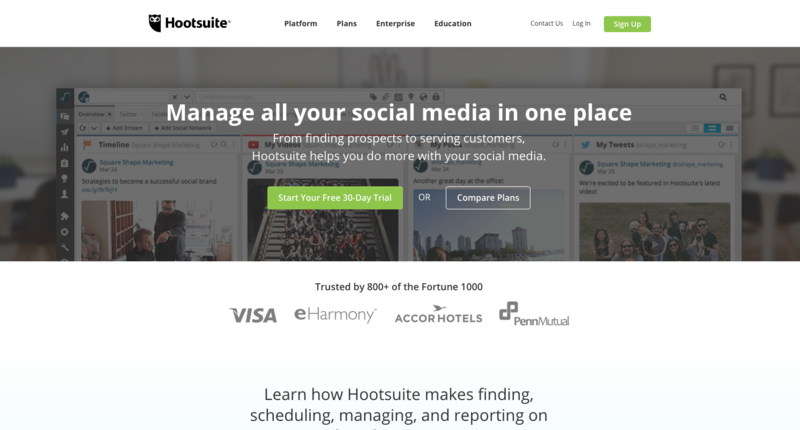 Hootsuite has the most valuable free plan though. You can manage up to three social media accounts in their free plan. For scheduling, you can set up to 30 messages per month. You can post as much as you want, but for scheduling in the future, you'll have up to 30 messages. So for instance, if you're managing a Facebook page and Instagram account, you can schedule 15 messages for each to go out throughout the month, and then post as much as you want on the spot. Or, you can schedule 30 posts for Instagram and none for Facebook. Up to you! 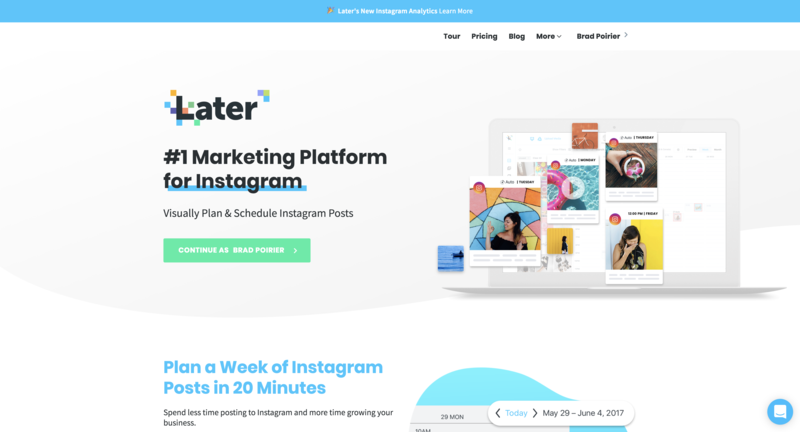 Speaking of Instagram, Hootsuite was one of the first publishing apps to have a direct integration with Instagram – meaning, you can schedule a post from your desktop computer to send to Instagram. Hootsuite gives you an RSS integration as well. You can put your blog RSS in and then it will auto post whenever there is a new blog entry. You can't talk about social media schedulers without talking Buffer. 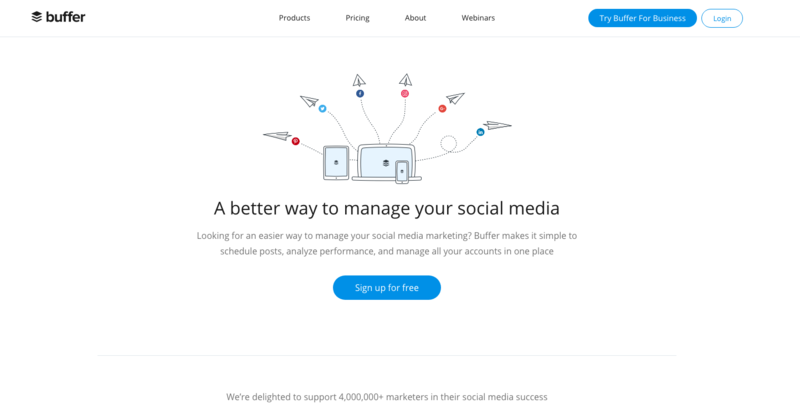 Buffer is probably the cleanest, simplest scheduler out there. 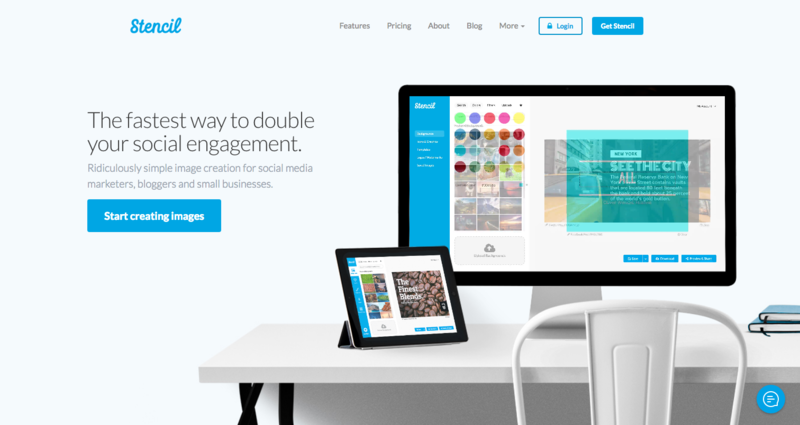 Buffer integrates fabulously with many other apps, including Stencil, Feedly, and Pocket. My three favorite features about Buffer is there content inbox, queue, and analytics. The content inbox is a great way to keep your queue fed. (You need to feed the queue!). You pop in a couple RSS feeds and Buffer will add it to the content inbox. You can then preview the article and add it to your queue. Speaking of the queue, once you add a social media channel, Buffer will automatically set up a suggested queue of posting times. It's tailored per channel. So if you setup a Facebook page, Instagram account, and a Twitter account – the queue will be different for all three of them. It's based on suggested best days/times to post. You can completely customize the queue times and days though if you want. When you add content, you can either publish now, add to queue, or super awesome feature share next. The share next will push another item down the queue, so it still gets scheduled but then your newest content will be shared next. Once you add content to the queue, you can just set it and forget it. Or you can move posts around via drag and drop. Alternatively, you can get a birds eye view of your content calendar and see what's going out for the week/month. The analytics tab is super clean and easy to read. It's going to show you all recently published posts by default. The next tab will allow you to sort by most popular. You can set the popularity by most likes, comments, clicks, shares, or reach. This is excellent for recycling high performing content. If your focus is on clicks, just sort by most clicks, find the top 2-3 content pieces and then you can reschedule the post to go out again in the future. You can schedule it with the same content, or you can update the photo or the text if you want. This is one of those apps that should be obvious, but sadly so many businesses are using the regular "blue" Facebook app to manage their business page. The blue app is the standard app you use to get your personal Facebook feed. 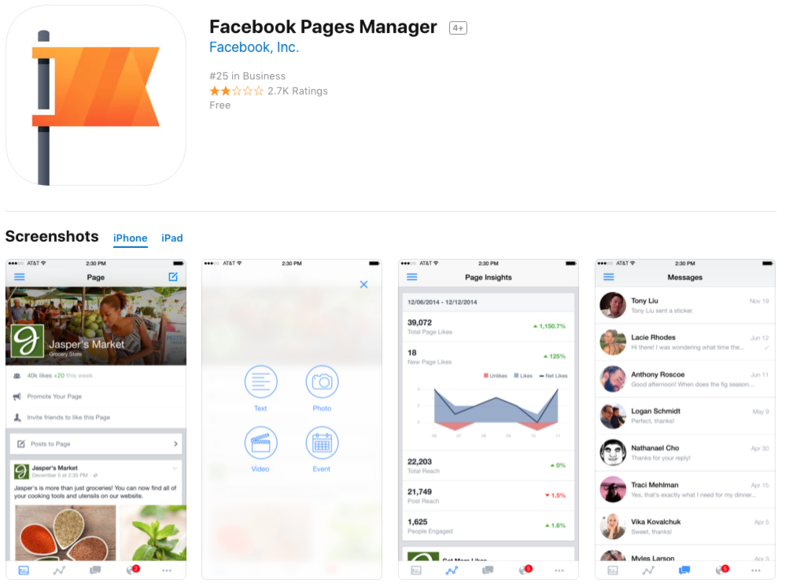 The Facebook Pages Manager app is the official app from big blue themselves. It's more advanced than using the regular app. One hidden feature is that you can manage BOTH your Facebook and Instagram inbox from the one app. Any comments or direct messages from either Facebook or Instagram will get filtered to this one app. Makes it easy for keeping your audience engaged. 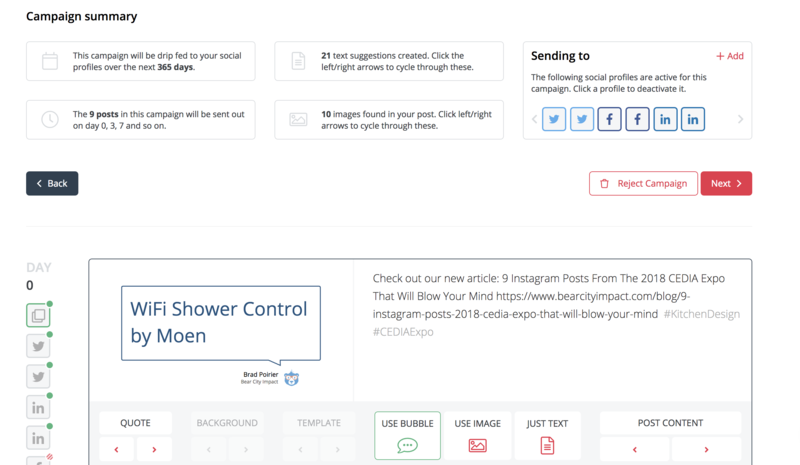 KingSumo isn't directly a social engagement tool, but it has some engagement features in it. 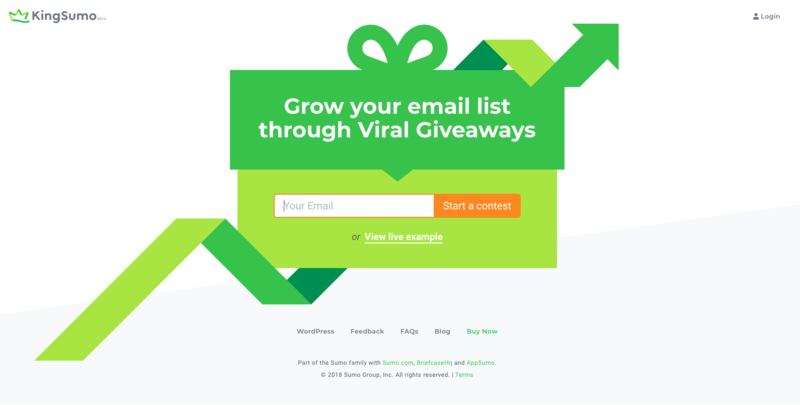 Primarily, KingSumo helps you grow your email list, which you should be doing also. The sharing and liking for entries will help create social media engagement. I used KingSumo for a client giveaway recently, and the results were fantastic. Plus anyone who entered the contest, we setup an auto-responder email with a special contest code where they could shop only during the contest period with a special discount, which created increased orders during that time. Tagwin is similar to King Sumo, but designed for Instagram specifically. 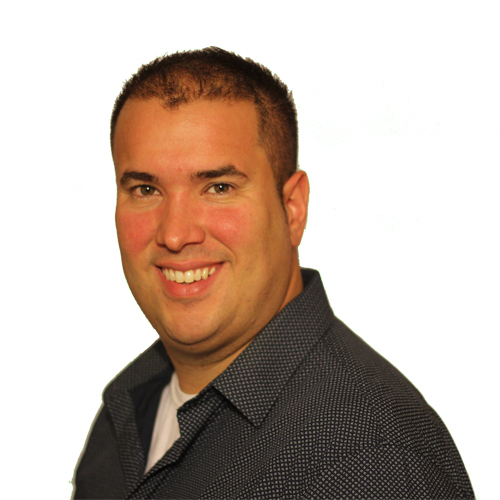 Often you want to draw traffic back to your website. Ugh, I know it. Instagram doesn't let you put clickable links in your posts. And double ugh, they only allow for one link in your bio. Yay for Campsite. 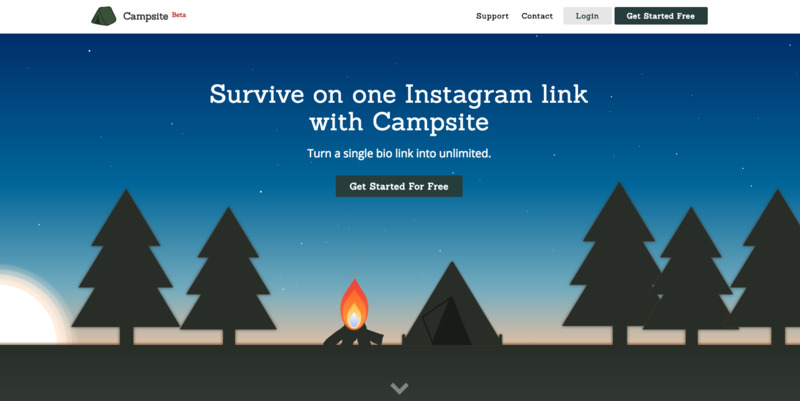 Campsite is a free landing page of sorts. You just add a bunch of links to your campsite page, and then you'll copy your unique campsite link and put that as your website in your Instagram bio. Then, when someone goes to that link, they are presented with all of your links associated with each post. You can even use the picture from the post to match up! The page is completely customizable also. From the background color/image, button colors, profile image, etc. This is a Wordpress specific plugin that is mostly suited for SEO. However, social sharing plays a big role in your search engine find-ability. When you share any link to Facebook, the Facebook computers try to automatically associate an image with that link. It doesn't always do a good job. Sometimes, it will grab the logo of that website, or some other image on the page. 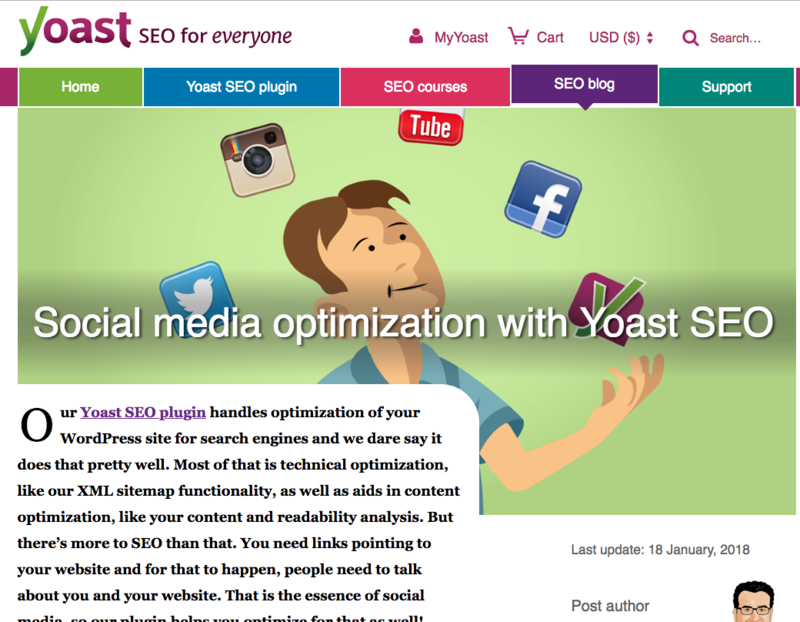 Yoast makes sure that an open-graph image is set for your blog or any page of your website. Open-graph is the protocol used by Facebook (and other social channels) to pull images from a website to attach to links. You'll never have crappy image shares again! Yoast makes it easy to set the image you want to be shared. You can customize this for each network as well, since Facebook, Twitter and Pinterest for example all have slightly different image share sizes. Twitter will pull the image used for Facebook and just crop it, but if you're the fine-tuner-type-of-person, then you can set it manually. So you're on this website and you like what you're seeing. You want to share it with others. Crap, how do I share it. Where's the Facebook button. Don't be that website. 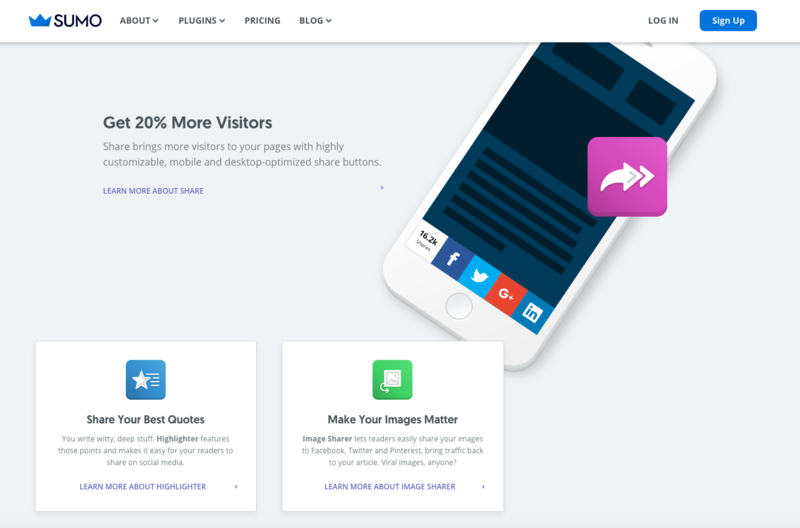 Sumo makes it super easy for people to share your content. Quotes. Sometimes you go an select a snippet of text you want to share, and then usually you'll go and copy that into Facebook. Well, Sumo is sneaky. They know when you're selecting text and it'll prompt you to share that selected text in a new share window. Those were the 17 apps I highly recommend. I asked a group of social media peers to give their recommendations. Here's what they had to say. Tracey Lee Lorenson likes Loom recording for "the ability to explain simple principles online". Loom is definitely awesome for that. I use it myself. In one click you can start recording your desktop and then when you're done, you'll instantly get a shareable link. So you can just place that link to a social media page, or a private group you're in for instance. Neeraj likes Revue. Revue allows you to start a mailing list which curates links to your audience. They have a free tier up o 50 subscribers. Cathy Larkin of Web Savvy PR likes Pixlr. It is an online image editor that she uses to optimize images so they don't slow the website down. She uses the online app to resize huge photos so they are 72 dpi and less than 100 kb, and the right dimensions for use in a header or slider, or in the body text of a page or a blog post so they don't slow the site down. If you want to get great looking video for your business, and you don't want to break the bank – I have a great setup for you. In this video I'm showing you the four things you need for an affordable iPhone video setup for your business.